Design Exchange (DX) is a not-for-profit museum funded by its members and donors. DX is Canada’s only museum dedicated exclusively to the pursuit of design excellence and preservation of design heritage. Design Exchange is located in Toronto's financial district in the historic Toronto Stock Exchange building. The DX contains the Permanent Collection of Canadian Industrial Design and is home to the Clairtone archives, Fred Moffat archives and Thomas Lamb archives. The building presently occupied by the Design Exchange was used by the Toronto Stock Exchange from 1937 to 1978. The federal agency Design Canada closed in 1985, followed by the University of Toronto's (soon rescinded) announcement in 1986 that it intended to close its school of architecture. 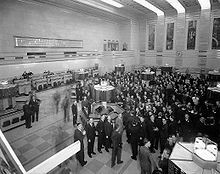 In 1983 the Toronto Stock Exchange had abandoned its historic home for the last 46 years at 234 Bay Street, which had been declared a heritage property in 1978. Olympia and York (O&Y) purchased the building. In return for the air rights to build an office tower on the site, O&Y agreed to retain and restore the building. O&Y commissioned a study to consider the idea of using the trading floor as a public facility. The study indicated that Toronto designers would support a cultural design centre. In January 1986, a group of designers organized an event to lobby Toronto City Hall in support of the initiative. City officials recognized a body of ten citizens as "The Group for the Creation of a Design Centre in Toronto", which was incorporated on February 6, 1987, and came to be known as the Design Exchange. In 1986, O&Y sold the Bay Street property to Cadillac Fairview and The Toronto Dominion Bank (Toronto-Dominion Centre West Limited), conditional on the design centre concept being retained. The new owner was also required to provide $500,000 to the City for 25 years, which would, in turn, be passed along (minus a 10% holdback) onto the design centre to offset operating costs. This agreement, in effect, gave the Design Exchange operating rights in the historic building. In 1988 the design centre was named the Design Exchange and the original citizens' group was made the founding board. The group established a Board of Management (which included the founding board and citizens and a couple of city councillors). Kuwabara Payne McKenna Blumberg Architects was commissioned to renovate and enlarge the non-heritage-designated spaces (exhibition spaces, administrative office space, the resource centre and meeting rooms). The same year the Group for the Creation of a Design Centre in Toronto began a capital campaign drive aimed at raising funds from the private and public sectors. In 1993, after years of lobbying, the federal and provincial governments confirmed funding for capital expenses in the sum of $6.3 million. In 1994, The Group became the sub-tenant with a long-term lease until 2091. On September 21, 1994, the Design Exchange was officially opened by Prime Minister, The Right Honourable Jean Chrétien. In 1996 the Design Exchange set a mandate for its Permanent Collection: to collect the best Canadian materials designed since 1945. As of 2016, the DX Permanent Collection contains approximately 600 items. Design Exchange has mounted more than 400 exhibitions, organized hundreds of seminars, lectures, international conferences and educational programs and publications related to the role of design in culture, industry, and business. A gift shop at the Design Exchange, June 2012. Several months earlier, the museum began to operate exclusively as a museum for design. In March 2012 the Design Exchange came under the directorship of Shauna Levy, and began to operate exclusively as a Design Museum - Canada's only museum dedicated exclusively to the pursuit of design excellence and the preservation of design heritage. Under the leadership of Shauna Levy and a renewed strategic vision embraced in March 2012, DX has hosted renowned traveling exhibitions from prestigious cultural institutions across the globe, including Stefan Sagmeister’s The Happy Show and Design Museum London’s Christian Louboutin retrospective, alongside its own This Is Not A Toy, guest curated by Pharrell Williams. Other exhibitions and events have included design elements from the National Ballet of Canada, a display of fashion items from the Hermès design house, a social history of women's undergarments, and DX Uncrated: Classic Plastics. In May 2015, DX launched a new direction with DX Satellite, a program of exhibitions located in various neighbourhoods throughout the city. By taking cultural experiences beyond the bricks and mortar of the DX building, this new satellite series allows a broad and diverse demographic to benefit from DX programs. This includes 3DXL - A Large-Scale 3D Printing Exhibition, and Smarter.Faster.Tougher. - an exhibition on Sports, Fashion + Tech that coincided with the Pan Am Games in 2015. In 2017, the Design Exchange launched a 10-day festival called Expo for Design, Innovation & Technology (EDIT), in partnership with the United Nations Development Programme. The Museum is affiliated with Canadian Museums Association, Canadian Heritage Information Network, and Virtual Museum of Canada. ^ "Toronto's architectural gems–the Design Exchange (The original Toronto Stock Exchange)". Historic Toronto. 2012-06-15. Retrieved 2018-01-18. ^ [Lord Cultural Resources Planning and Management Inc., "Design Centre Feasibility Study" (Toronto: report prepared for City of Toronto Economic Development Committee, 1987)]. ^ "Design Exchange | History + Founders". Retrieved 2018-01-18. ^ Proteau, Adam. "Raising capital at the Design Exchange"